Shares of Herbalife jumped Thursday after the nutritional supplement company said billionaire investor Carl Icahn will be allowed to nominate two board members. Herbalife (HLF) shares ended the day up 7%. The stock was briefly halted on the news. Under the terms of a deal with Icahn's holding company, Herbalife agreed to have Icahn nominate two members to the company's board, which will grow to 11 directors. The new board members will need to be approved by the company's nominating committee. 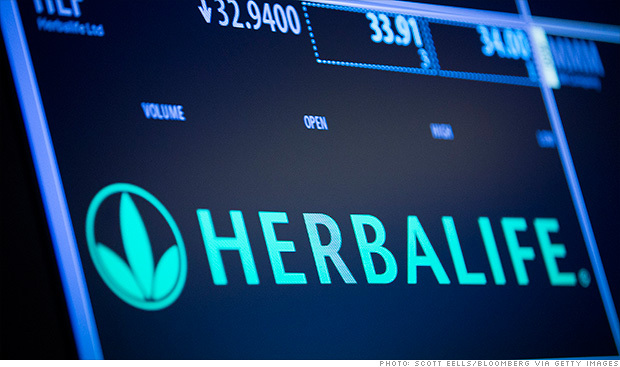 The appointments will be made sometime before Herbalife's annual shareholder meeting. In addition, Icahn now has the right to increase his stake in the company to a maximum of 25%. Herbalife is at the center of a clash between Icahn and rival hedge fund billionaire Bill Ackman. Back in December, Ackman called the multi-level marketing company a "massive pyramid scheme" and said he'd placed a $1 billion bet against Herbalife. Icahn responded in February by announcing a 13% stake in Herbalife. He has since been a vocal supporter of the company, and an outspoken critic of Ackman. In an interview with Bloomberg Television, Icahn said he wants to buy more shares in Herbalife, though he was unsure the current price was right. Icahn has said he is exploring strategic options for the company, including taking it private. "Ackman has given us an opportunity to buy a company cheaply at a discounted price," Icahn said. "And for that I thank him, actually." Icahn also reiterated that he does not like nor respect Ackman. The rivalry played out on live TV last month, when Icahn and Ackman traded insults on CNBC. Icahn called Ackman, among other things, a "liar," a "major loser," and a "crybaby in a schoolyard." Ackman responded by calling Icahn a "bully" who "takes advantage of people" and "not an honest guy."